The latest PowerVM™ virtualization including PowerVM Live Partition Mobility and PowerVM Active Memory™ Sharing. EnergyScale™ technology that provides features such as power trending, power-saving, capping of power, and thermal measurement. 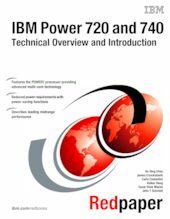 Professionals who want to acquire a better understanding of IBM Power Systems products can benefit from reading this paper.